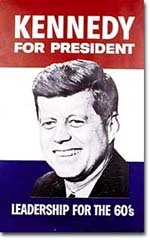 John F. Kennedy's youthful good looks helped him win the White House in 1960 and usher in an era of American politics remembered as "Camelot." The dream turned to a nightmare in 1963 when Kennedy was cut down by an assassin's bullet. When John F. Kennedy defeated Richard Nixon in 1960, the United States was at the apex of its postwar optimism. The 1950s economy raised the American standard of living to a level second to none. Although communism was a threat, the rebuilt nations of Western Europe proved to be solid Cold War allies. The Soviet Union had the technology to send a nuclear missile across the North Pole, but the United States maintained a superiority that could obliterate any nation who dared such an attack. Across the world, newly independent nations looked to the United States for assistance and guidance. Few Americans would have believed that by the end of the decade, the nation would be weakened abroad and divided against itself. 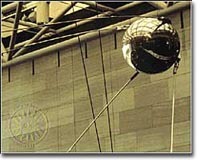 Launched by the Soviet Union in 1957, Sputnik was the first artificial satellite to successfully orbit the Earth. 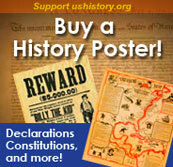 It was also the impetus for the formation of the National Air and Space Administration — or NASA — in the United States. Kennedy embodied that early ebullience. The youthful president and his wife drew parallels to the magical time of King Arthur and Camelot. His New Frontier program asked the nation's talented and fortunate to work to eliminate poverty and injustice at home, while projecting confidence overseas. Although Congress blocked many of his programs, his confidence was contagious, and the shock of his untimely death was nothing less than devastating. Upon the assassination of John F. Kennedy, then Vice President Lyndon B. Johnson set out to complete the work that Kennedy had started. However, Johnson's vision of a "Great Society" was stymied by America's involvement in Vietnam. Lyndon Johnson hoped to complete Kennedy's work. His Great Society plan declared a "war on poverty" that produced a glut of legislation unseen since the days of Franklin Roosevelt's Hundred Days. Welfare benefits were increased, health care costs were defrayed, and funds were allotted for cleaning the air and water, rebuilding cities, and subsidizing the arts and humanities. A Civil Rights Act ended legal discrimination in public accommodations with regard to race. Unfortunately for Johnson, the domestic minded president became mired in a foreign imbroglio — the war in Southeast Asia. Vietnam would taint his legislative successes and end the possibility of a second Johnson term. By 1968, the zeal for domestic reform was squelched by an increasingly popular war. Families and friends across America were divided by the conflict. Assassinations of Martin Luther King and Robert Kennedy only fanned the flames, and by the end of the decade most Americans were weary of war, rioting, and political crusades — Americans sought a return to normalcy. 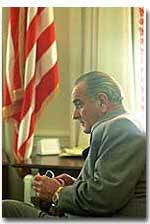 Listen to secretly recorded conversations made by President Lyndon Baines Johnson in the White House Oval Office.